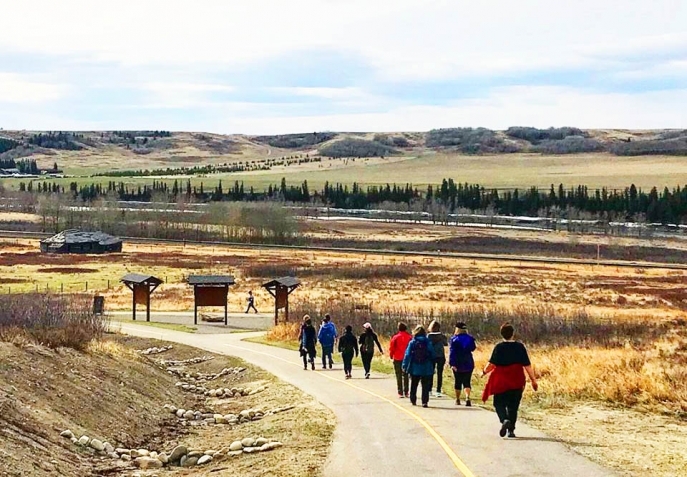 Discover the fascinating history and ecology of Glenbow Ranch Provincial Park all while keeping fit and having fun! Our two-hour guided BYOB (Bring-Your-Own-Bike) tour will take you to the east end of our park showcasing historic points of interest, stunning vistas and a few great spots to rest and take in your surroundings. These tours are suitable for anyone able to cycle for a two-hour period. 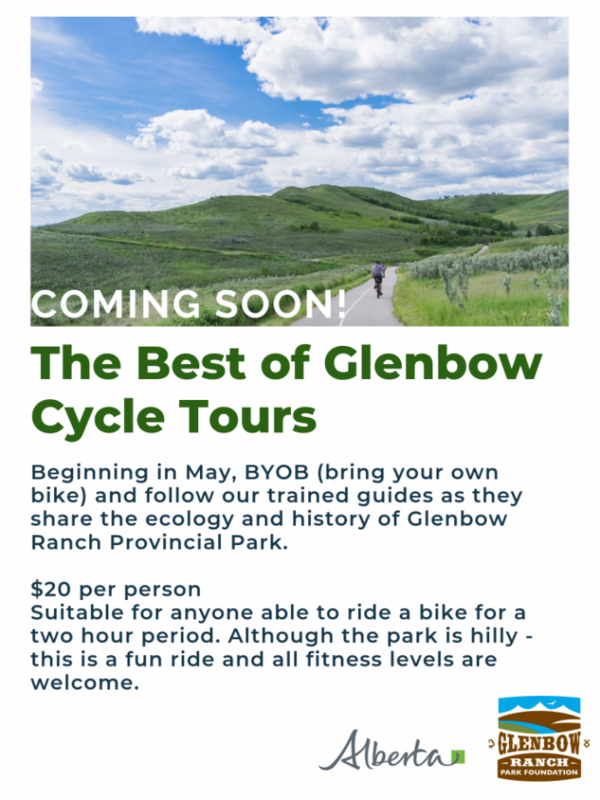 Although Glenbow Ranch is hilly, this tour is meant to be a fun ride and not a race. We have two tours scheduled for May 12th and 26th with many more to come in June, July and August. Keep an eye out on our ‘Events’ calendar as more will be added soon! Ever wonder how fast North America’s largest bird of prey can dive? 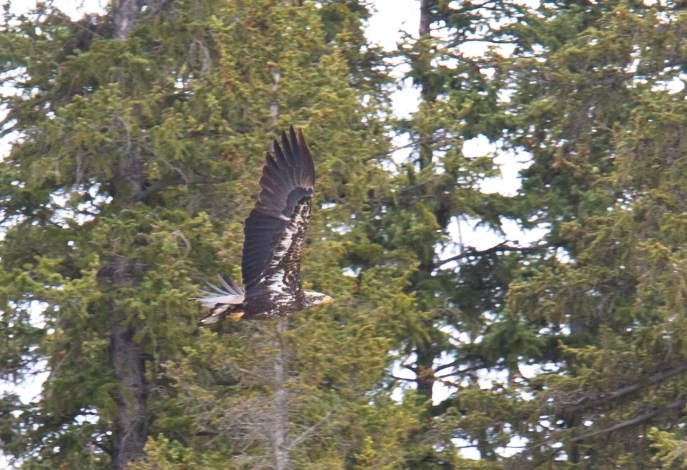 Since 1992, Rocky Mountain Eagle Research Foundation (RMERF) volunteers have performed annual raptor migration counts at the same site location in the Kananaskis Country, Alberta. The Rocky Mountain Eagle Research Foundation is a non-profit organization, registered in the Province of Alberta, with Canadian charitable status. The Foundation is dedicated to the study of migrant and resident eagles and other birds of prey in the mountains of Western Canada. In addition to its scientific work, the Foundation is committed to educating people about birds of prey. This will help protect birds and their prey foods and habitats for the future. Come join us as we discuss these amazing birds and their annual journey through Kananaskis! 405 Railway St. W. Please consider a donation to help support the Park Talks program. Here at Glenbow Ranch Provincial Park, land is leased to local 3J Farms, whose cattle play an important role in grassland management. With winter seeming to never end, we asked John Copithorne of 3J Farms how he and his cattle prepare for and manage the long winter months. How do you prepare for wintering cattle? A lot of preparation goes into getting cattle and infrastructure ready for a cold Alberta winter. In the fall, after the calves are weaned from the cows, we sort off any cattle that don’t look fit enough to endure a harsh winter. The remaining herd is moved to a pasture that has plenty of fresh grass, so that they can build up on body fat reserves before the cold weather hits. We spend a lot of time working on cattle, waters and equipment in the fall, so that when needed, they hopefully will work as needed. Getting the necessary amount of feed moved to hay yards close to wintering grounds is also important in the fall. What are the challenges of looking after cattle in the winter? 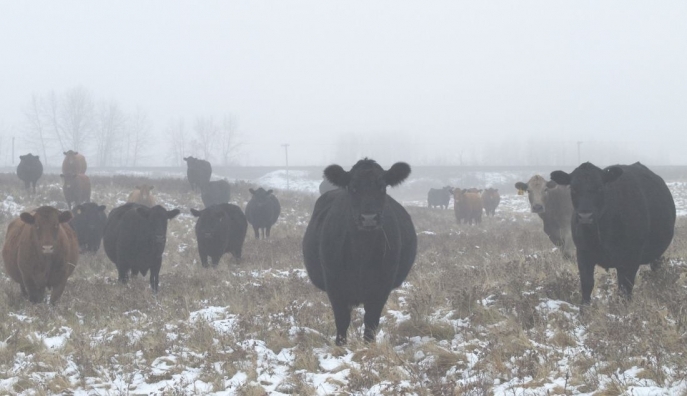 The challenges to looking after cattle in the winter vary with temperature and snow amount. Do you feed them differently? As temperatures drop the amount of forage an animal needs rises. An animal’s requirements for temps in the -10c or higher range are about 30-35lbs of forage daily. When the temps get in the -25c or lower and factor in wind chill, these daily requirements can rise to 35-40 lbs daily. The amount of snow can determine if we have to put forage out for the cow daily, or if she can still go graze on grasses for her daily forage needs. Our biggest challenge if the snow gets too deep and we have to feed the cows daily, is making sure that we can get our feed trucks to the cows through the snow. We are always having to plow snow to keep open passages to the feed grounds. Making sure that cattle waterers are working as well is a big challenge in -20c and colder temps. Water doesn’t like to stay in a liquid form in those temps! How do cows stay warm in the winter? Cows have an unbelievable internal furnace. The key to any furnace is keeping it stoked with good fuel. Lots of good grass, feed and shelter. 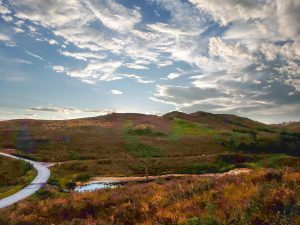 Glenbow Ranch Provincial Park provides plenty of those resources in spades. Cows in good body condition, with thick hair coats, can endure very cold temps quit comfortably. 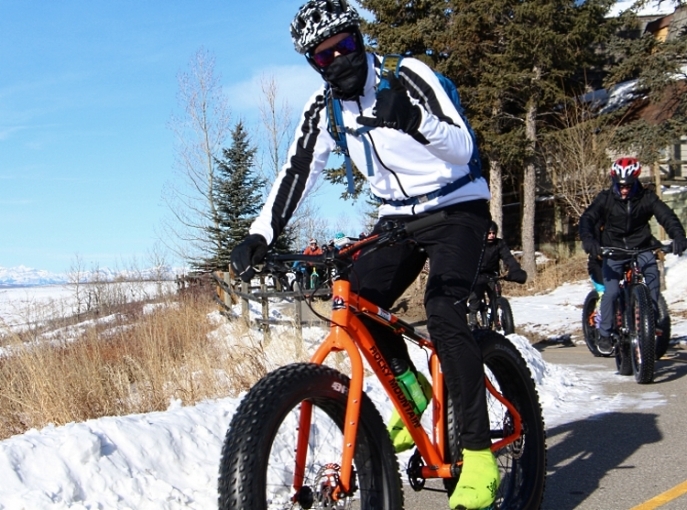 Our March 9th Fat Bike Tour of the Ranch is fast approaching! We have sold out our morning tour but still have spots left for our afternoon tour. Learn all about the history and ecology of Glenbow Ranch while trying out fat biking! Tickets for those needing a fat bike are $60. However, if you own your own bike but what to come along for a guided tour, tickets are $35. Tickets include your tour, coffee and hot chocolate supplied by Cochrane Coffee Traders and swag from our event partners Bike Bros. 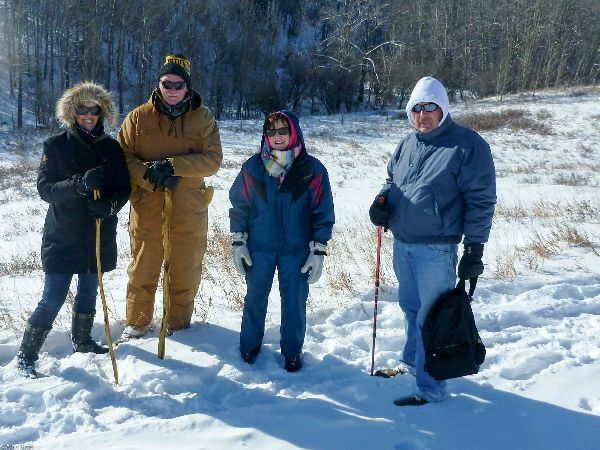 While the extreme cold kept a few participants with young children home, our Family Day Hike at the Ranch was a great time for those who bundled up and took part! The extreme cold temperatures and abundance of snow made for a perfect setting when Alan Sitter, our hike guide, described the bitter winter of 1883 that cost the lives of hundreds of cattle and changed the course of ranching in Southern Alberta. Dozens of deer were out too, digging in the snow to reach food sources – in particular, juniper, which deer eat for its calcium. All in all, it was an informative and fun hike. Thank you to Alan and all who took part! Our next guided hike is scheduled to take place May 25th. 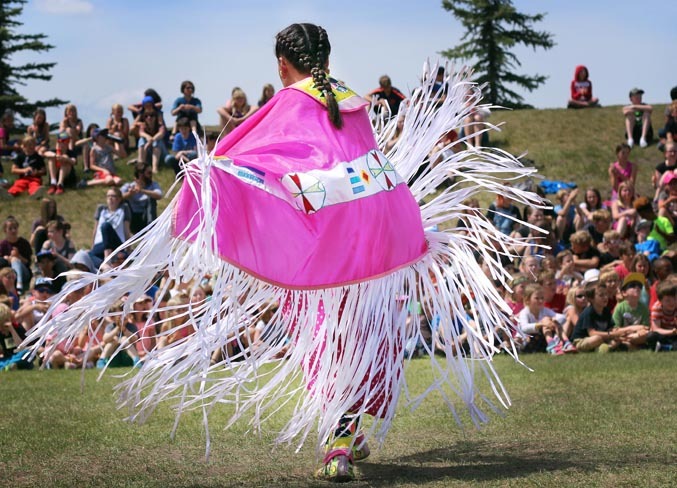 Mark June 21 on your calendars as Glenbow Ranch is planning a massive celebration for National Indigenous Peoples Day. Sarah Parker, the park’s executive director, said while it is still early in the planning stages the park is looking to create a day that showcases all Indigenous culture has to offer. From dancing and drumming to Indigenous games, she said the event will be something for the whole family. Badgers in your Backyard – A glimpse into the ecology of an important grassland predator. This presentation will give you insight into the ecology of North American badgers, demonstrate how these fossorial carnivores can help us maintain and restore healthily grassland systems, and dispel a few common myths. Nicole Heim is a Wildlife Ecologist who has focused on understanding and conserving terrestrial carnivores. With over 15 years of experience, she has hands on experience researching cougars, bears, badgers, and wolverines. In addition to the fierce and fuzzy critters, Nicole has focused her attention on understanding how natural and human land-use factors influence long-term population persistence carnivores and other terrestrial mammals throughout Rocky Mountains and along Alberta’s East Slopes. 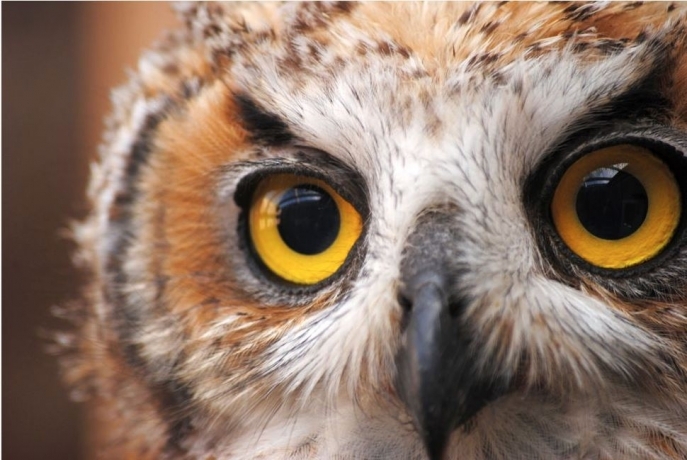 Whooo knows about wildlife rehabilitation? 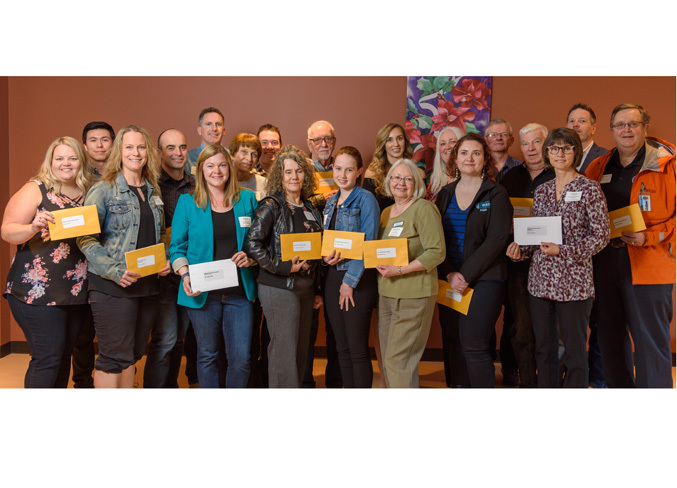 Calgary Wildlife Rehabilitation Society does! 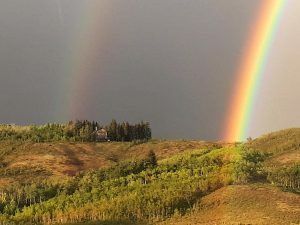 The Calgary Wildlife Rehabilitation Society (CWRS) is an organization dedicated to treating injured and orphaned wildlife, providing valuable outreach and education services to the community and engaging all volunteers in motivational work and skill building experience. You are! We invite you to kick off this year’s speaker series with a talk by Jenna McFarland at the Calgary Wildlife Rehabilitation Society about their organization’s efforts in and around Calgary, especially with owls. Jenna McFarland has been a working zoologist for 17 years, the last 7 of which have been at the Calgary Wildlife Rehabilitation Society. As the Director of Animal Care for Calgary Wildlife, she is responsible for the over 2500 patients that enter the clinic every year. Though her career began on the coral reefs of Australia, she now spends her days on land where she is particularly passionate about large rodents and neonatal mammal care. Jenna is an enthusiastic naturalist and loves to speak to groups of all ages about the wonders of the natural world.